MagazineMarketers.com is a resource for those who work or want to work in media marketing, promotion and merchandising. Whether you’re selling magazine advertising space, Internet page views, radio or TV time, or some other type of media audience, this site will help you find the tools you need to write better presentations, understand the business, and succeed at your job. We also welcome graphic designers to this site. Sign up for our mailing list and receive FREE tips and tools. This is also the home of The Concise Guide to Magazine Marketing: Tips, Tools and Best Practices, a resource and style guide for today’s media marketers. Renée Martin, with the help of a dozen others, break down the tasks performed in marketing so that you can understand them better and create them more easily. With tips, cheat sheets, vocabulary lists, tools and examples, this book is written in very easy-to-understand language with very handy-to-have elements. 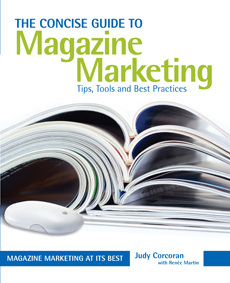 Judy Corcoran and Renee Martin have presented this book's information for the Magazine Publishers of America. The book is also used as a text book at New York University. Visit the Magazine Marketers forum! Click here to see its Table of Contents, sample pages, and to purchase the book.